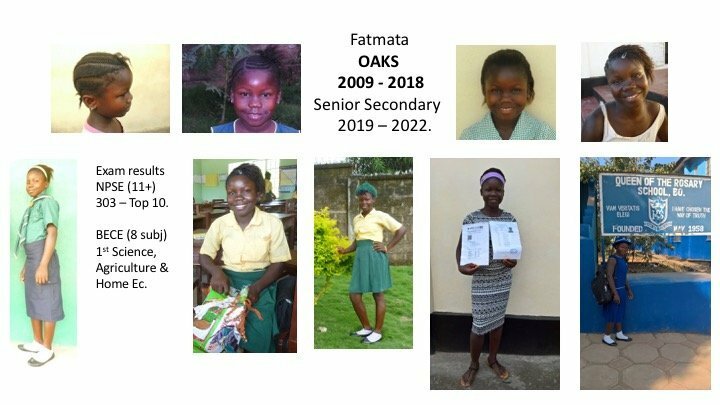 Fatmata has been sponsored by OAKS via our founder Margaret. She recognised Fatmata as a feisty spirit with a desire to learn. She was brought from her ‘bush village’ at the age of 6, which unfortunately offered her little regarding personal development or education. This was all done with the full permission of her parents, they greatly welcomed the opportunity for their daughter to gain qualifications. Fatmata was enrolled at OAKS 2009. She was a challenge. She tried to solve her frustrations and problems by hitting and kicking! With oodles of patience and guidance she has blossomed into a fine and accomplished young lady. She’s lives as part of an extended family at OAKS House, with Margaret’s nephew, wife and 3 children, plus an Aunty and 2 more of Margaret’s adoptees. Fatmata has achieved great exam success. Pass mark for NPSE (11+) is 230. She scored 303! BECE (GCSE) requires 6 passes. She gained 8. 3 sciences with the top grade! !